In Mercedes-Benz circles it's referred to as the R171 model, and this SLK was finally able to compete with the BMW Z4 and Porsche Boxster on more equal footing in regards to driver appeal. The second generation of SLK arrived in 2004, adding more curvaceous styling to Mercedes-Benz's folding hard-topped roadster concept. In Mercedes-Benz circles it's referred to as the R171 model, and this SLK was finally able to compete with the BMW Z4 and Porsche Boxster on more equal footing in regards to driver appeal. It might have finished production in 2011, but even the very earliest R171 SLKs still look fabulous today, which, given their now affordable price tags, makes them an appealing buy for those wanting some style mixed with day-to-day usefulness. Other than those looks, key to the SLK's appeal and usability is its clever folding hardtop. Where its rivals all feature folding fabric roofs the SLK has a hard top that gives it coupé-like security and weather-tightness when it's up, and wind-in-the-hair appeal when it's down. A no-compromises roadster then, so long as you remember it remains a two-seater and loses a good portion of its boot space when that top is stowed. Around the world the SLK was sold with a range of engines that encompassed everything from the volume-selling 1.8-litre supercharged petrol unit, badged 200K, via a pair of V6s of 3.0- and 3.5-litre capacities, to a 5.4-litre V8 in the rare, SLK 55 AMG. You'll do well to find anything other than the SLK 200K in Ireland, though, and really the more bombastic pace the bigger engines brought only add to the running costs. 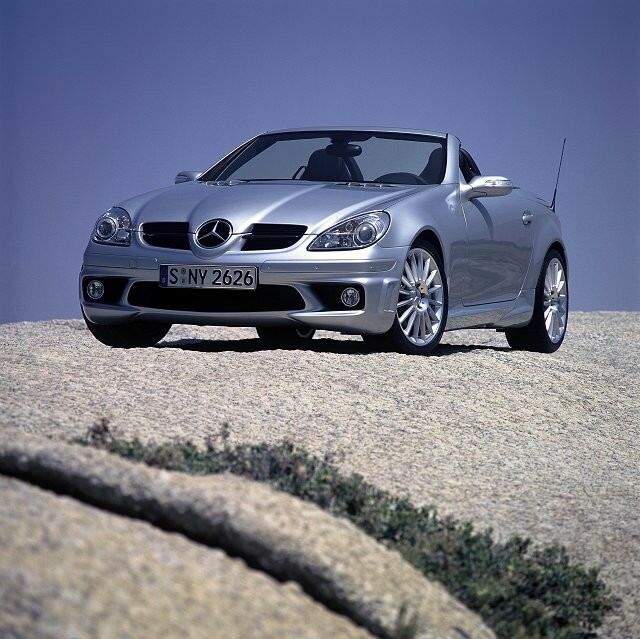 The SLK 200k came as standard with a six-speed manual gearbox, though Mercedes-Benz did offer a five-speed automatic option (seven-speed in the V6s). A mid-life refresh to the range in 2008 saw the SLK 200K's output increase from 163- to 184hp, while the styling was updated; facelifted cars are easily recognised by the cut out lower portion of the front splitter that was a visual nod to Merc's F1 race car at the time. Inside, post-facelifted cars also benefited from greater connectivity, air conditioning as standard and revised instruments. You'll struggle to find anything but the SLK 200K in the Carzone classifieds, though that's no bad thing. It's arguably the sweetest driving of all the SLKs, even if it does lack the bigger engined cars' outright firepower. It came as standard with a manual transmission, but some have been optioned as autos - which are easier to drive of course, but they come with increased fuel consumption and emissions figures. Sport trim adds firmer suspension, which is a touch unyielding on rougher roads. A post-facelift standard SLK 200K manual is a solid all-round choice. Good looks, a fine drive and now at surprisingly affordable prices used, the SLK is a solid roadster choice that's more practical than its rivals, but no less fun. The three-pointed star on the bonnet means running costs will be relatively high, but reliability is good, so keep on top of servicing and it'll not break the bank.